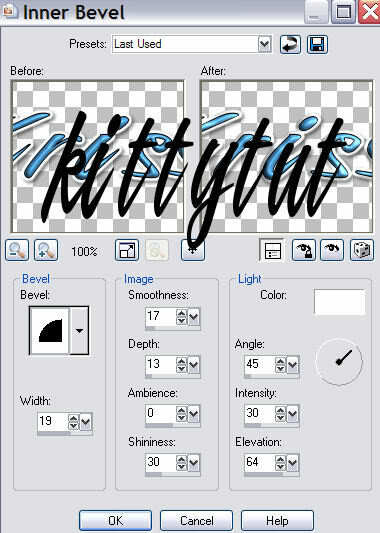 This tutorial was written by Kitty on November 16, 2007. Any resemblance to any other tutorial is coincidental and un-intended.This is registered with TWI. Please do NOT copy it or claim it as your own! I am using the adorable work of Joel Adams. Please do not use his work unless you have a license to do so. You can get his work and a license at CILM. All the accessories/embellishments used in this tag are the awesome work of Rainbow Coffi! You can download these supplies and much more of her work at PSP Playground. Membership is free! Copy and paste your window frame onto it. I applied Eyecandy 5 Nature Snow to the frame twice. First setting will be dusting moderate. Next setting will be large first flakes. Now copy and paste your house tube. Resize this until it is small enough to fit within the window nicely. On a new layer add your snowback and pull it behind the house. Trim off edges with your selection tool if you have overhang. Resize one of your fire logs until it is small enough to fit in the window of the house. I placed it off to the side just a bit so it did not look like the house was actually on fire! Now resize your pine boughs 50% twice. Place one at the upper right corner and add EC Snow, large first flakes. Duplicate your pine bough three times and line them up under the window as you like. Add a drop shadow of 1, 1, 55, 3. Resize your mistletoe to the size you want and place on tag. I chose upper right corner. Now place your tube on left side of the tag. Add a drop shadow of choice. Now add EC Snow Large first flakes. Add your copyright information. Please be sure it is clear!! Now you will add a border. To do this the tag must now merge. Go to Image>add border> 10 pixels>symmetric. Color is 96000b (if you want my red). Add your name now. I used A&S Black Swan. Apply the same inner bevel as above. And you are done!! Save as a jpeg or a png. Hope you enjoyed making your own creation! ©Kitty, registered with TWI November 17, 2007.